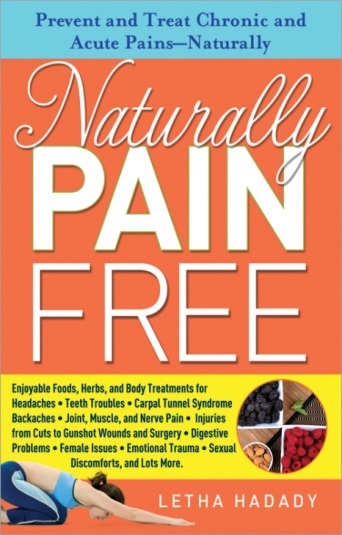 Letha Hadady's book Naturally Pain Free: Prevent and Treat Chronic and Acute Pains Naturally is a fairly comprehensive guide to alternative health solutions to various health issues. I read through much of the book & found it chock full of information, though I'm not sure I would try all of the remedies in it. I feel like many of her suggestions would be best supervised by a Naturopath or a Doctor of Traditional Chinese Medicine. If you are definitely interested in using methods other than the usual western medicine to treat an issue that you have, this book could be for you. Naturally Pain Free covers a wide range of treatments for many common health concerns and chronic pains as well as treatments for sports injury and surgery.It covers everything from simple pain-trigger foods to Asian and Western herbs, ointments, massage, and meditation to cutting-edge treatments such as applied laser acupuncture, stem cell injections, light therapy and marijuana pain pills. Of course medical treatments are done by a qualified physician and physical therapist, but many home treatments are easily available from grocery, health food store and online. The author's website offers up to date articles and videos on a number of related topics, including documentation of her total hip replacement surgery and avoidance of dangerous infection. Naturally Pain Free opens the door to treatments other than aspirin, liquor and ignoring pains that are important because they indicate deeper, more complicated problems.